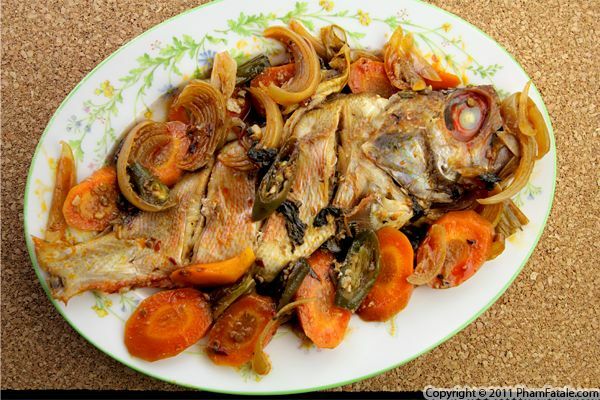 Today I cooked a freshly caught whole red snapper en papillote. The preparation is ultra easy. Simply combine garlicky, spicy (my homemade chile garlic sauce), slightly sweet (Jack Daniel's grilling sauce), salty and fatty ingredients (oil or butter) to make the marinade. Cover the fish with the sauce and after a 30-minute steam in the oven, you'll have a healthy and tasty meal. You'll also have time to do something else (in my case play with my 5-month-old infant daughter!). Spending less time in the kitchen doesn't necessarily means eating a less delicious meal! In this dish, I paired shallow pan-fried mackerel steaks with a fresh vegetable relish. The relish is made of baby cucumber, lemon, daikon radish, dill and wasabi-infused oil. 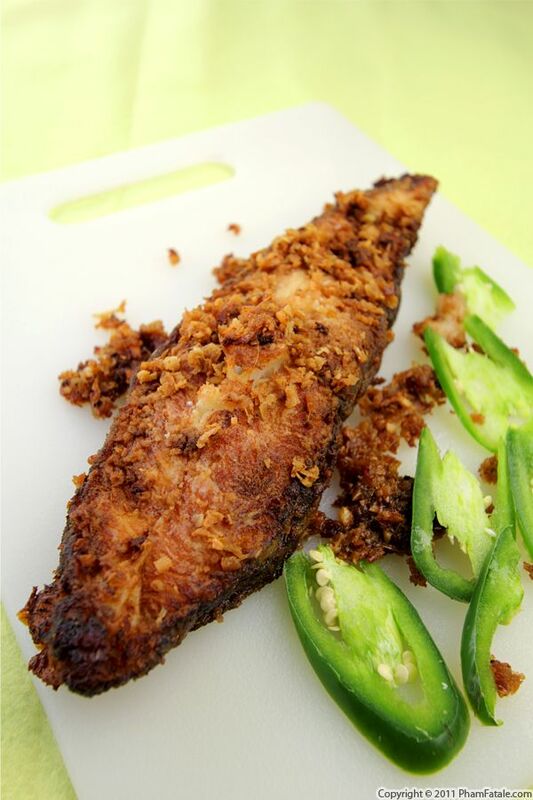 The sweet and spicy notes give the dish the ideal balance of flavor as the acidic taste cuts through the richness of the fried fish. 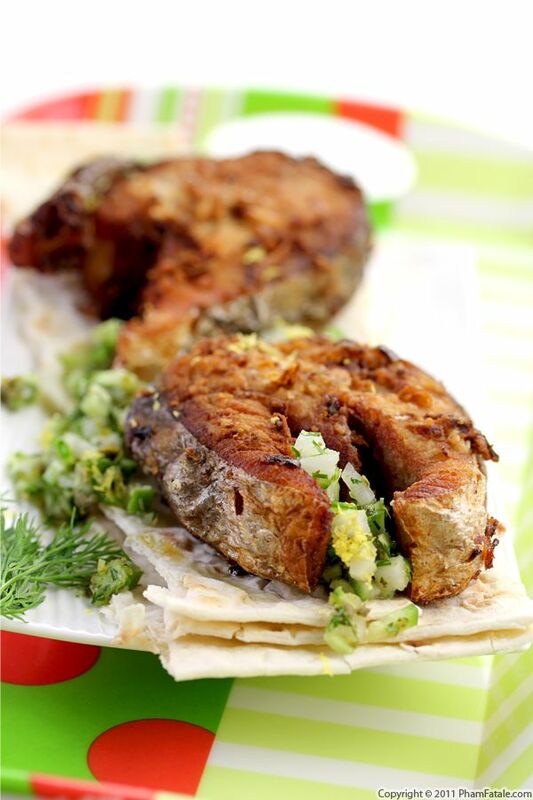 I served the pan-fried fish on a bed of lavash bread so it could soak up the delicious goodness from the relish. The dish takes no time to cook and the relish can be prepared in advance. You may have noticed that I eat (and thus am posting) a lot more fish than before. That's because I just found a new seafood market right on Tully road, in San Jose. The fishmonger always surprises me with his freshest catch. My most recent purchase was a couple of beautiful halibut steaks. Halibut is a very delicate fish so I had to use ingredients that accentuate without overpowering. First, I cleaned and rinsed the fish in lemony, salted water. The marinade time was fairly brief and contained the bare minimum: chile, onion and yuzu paste. I pan-fried the halibut steaks, to which I added fried chiles and onions as garnish. It’s always nice to give hints of what flavors are in the dish. The reason I used a generous amount of jalapeno chile is to prevent the fish from being tanh ("fishy" in Vietnamese). Maman used to say that there are two rules for making a good seafood dish: the fresher the product, the better it will taste and chile can be used to mask any unpleasant odor. My friend Hoa is an expert when it comes to buying the freshest, most delicious ingredients. I've probably said it in the past but I only cook seafood according to what's available at the market. She told me about this wonderful seafood market on Tully road in San Jose, and boy, was she right! Today I found freshly caught cá hồng, which translates to "red snapper". I made cá nấu canh ngót, a Vietnamese popular fish soup made with Chinese celery. 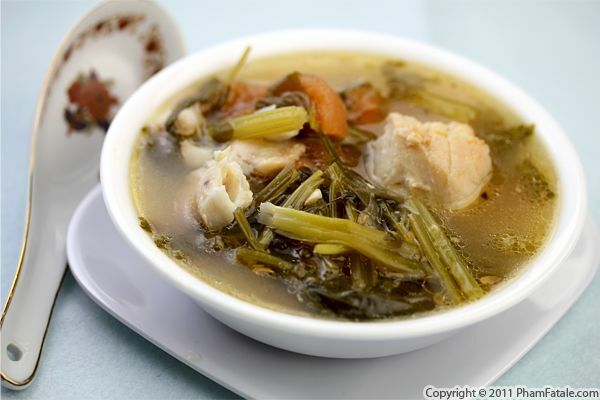 The texture of the soup is similar to canh chua the difference being that lemon juice is squeezed right in before eating the soup and no lemon or sour ingredients are added to the broth while cooking. You'll be amazed at how simple and easy this seafood soup is to make. The key to success is really just fresh ingredients. That's it! After giving birth, my doctor reminded me on multiple occasions to get enough calcium in my diet to support my own bone health. Of course, drinking milk and eating dairy products such as cheese and yogurt goes without saying. Another calcium supplement I like every now and then is sardines. They are tasty and very nutritious. I've always loved eating the bones, which are an excellent source of calcium. 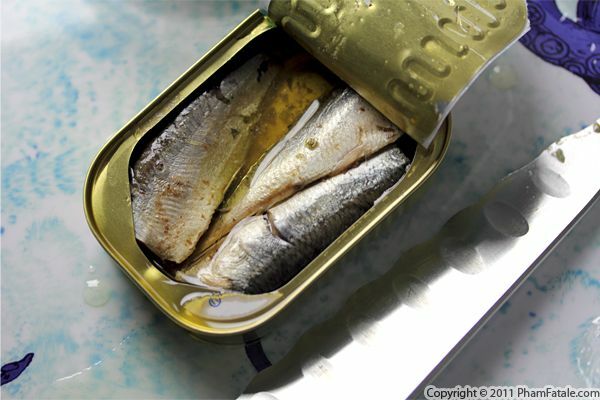 Unlike swordfish or King mackerel, sardines have a much lower mercury content. 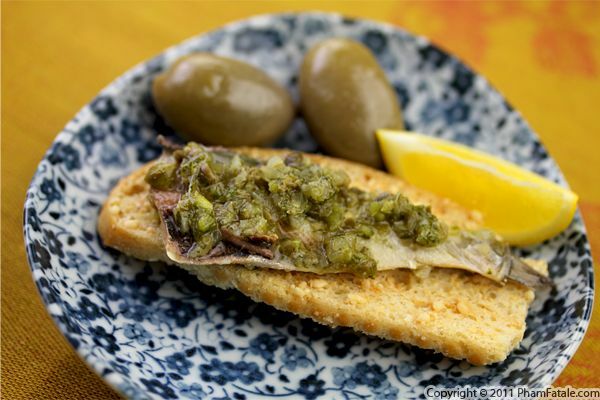 In this recipe I served the sardines on a bed of Parmesan crisps and flavored them with sauce verte. The green sauce is a very pleasant complement to the fish. It's made of green olives, capers, cornichons (tiny French gherkin pickles), lemon, garlic, Dijon mustard and extra-virgin olive oil. Next time you're looking for a snack packed with omega-3's and lean protein, you might consider making yourself this sardine treat. Page 8 of 13 pages.